It's been a very sweet holiday season in my home, with a cross-country cookie exchange, experimental fudge recipes (mixed results), and our first attempts at caramel squares and turtles (both wildly successful). I make no apologies for the astonishing amount of sugar we consumed: we enjoyed every bite. And I didn't feel at all guilty ignoring the fruit bowl overflowing with gorgeous persimmons, generously shared by a friend ... until yesterday. Then I felt guilty. Very guilty. After polishing off the last of the leftover Christmas cake, I was ready to give the persimmons the attention they so richly deserve. I chopped them up and simmered them with honey, spices, and a burst of fresh lemon. After the mixture cooled a bit, I spooned some into a cup of Greek yogurt and topped it with dates. I'm happy to report it tastes like Christmas, without the collateral nutritional damage. I'll devour this batch with nonfat Greek yogurt for protein-rich, guilt-free breakfasts, but it would be equally fabulous stirred into piping-hot oatmeal. If you're not ready to turn your back on sweets yet, pour some over a scoop of vanilla ice cream or frozen yogurt. I imagine a shot of candied ginger would be spectacular, but I left it out in deference to my dear but ginger-loathing husband. 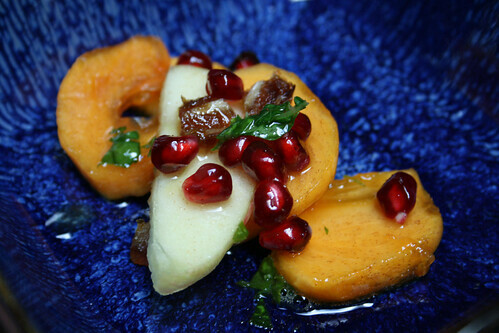 If you're looking for more creative ways to enjoy persimmon, try Winter Jewel Salad, with persimmon, pomegranates, and dates in a cinnamon-orange dressing that tastes like fall, and Persimmon and Fennel Salad, a crunchy and colorful salad with greens. This makes a generous cup of soft, sweetly spiced fruit perfect for stirring into yogurt or hot cereal or pouring over waffles or ice cream. It keeps up to a week in the fridge and freezes well. 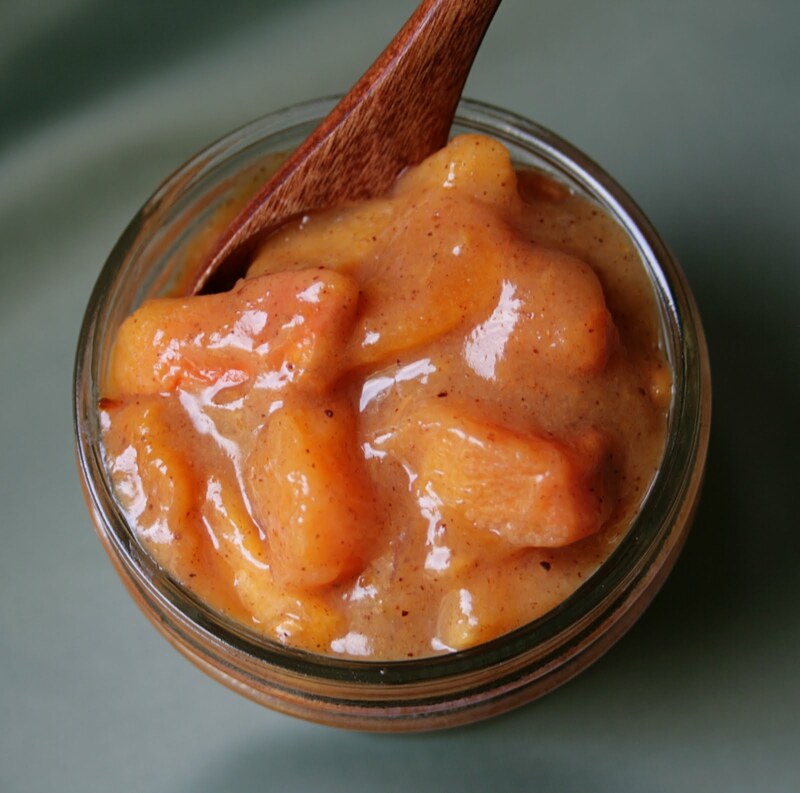 In a small saucepan, combine chopped persimmons, 2 tablespoons water, honey, and cider vinegar, if using. Bring to a boil over medium heat (about 4 to 5 minutes). Reduce heat to medium-low, add spices, and simmer for 10 minutes, stirring occasionally. In a small bowl, combine cornstarch and remaining two tablespoons of water. Add to fruit in pan and stir until thickened. Finish with a squeeze of fresh lemon. Remove from heat and cool before storing in refrigerator for up to a week. My personal belief as a cook is that deep-frying is exactly what I don't aim for, and many times I substituted the process by a little trick, called baking and broiling. This has been the case for some recipes already tested here with success such as mini kibbeh, made possible because of this little kitchen miracle, the oil mister. So, if celebrating the eight nights of Hanukkah — we are today lighting the third candle — this is a very tasty bite. It might be the ideal company for soup, for good conversation with friends, or just a cause for celebration. Happy healthy Hannukah! After reading many recipes and ideas on preparing potatoes for latkes, I came across this very good one: Use a salad spinner to get rid of water and starch from the potatoes. That will guarantee the crunchiness of the final product. Grate potatoes, transfer to a salad spinner, and spin about 6 times to get rid of the water and starch from the potato. Preheat oven to 400 F. Line two baking sheets with heavy aluminum foil. Let potatoes drain for about 15 minutes in the salad spinner basket while the oven gets hot. Beat eggs and matzo meal and add to the potatoes in a bowl, and then add grated onions. Sprinkle with salt, garlic powder, and freshly ground white pepper. If you feel the mix is too runny, add more matzo meal or flour: You want to get a fluffy moist mix, not runny but not dry. Spray olive oil on the foil-lined sheet. With a soup spoon, splash latkes over the sheet, leaving a 1/4-inch space between each. Bake for 20 minutes on the top rack of oven. Broil for two minutes. Serve hot with your favorite recipe for applesauce. Mmm, time to bring on some dessert! We're feasting on gingerbread cutouts and chocolatey goodness in my home, but it can sometimes feel like a bit too much. 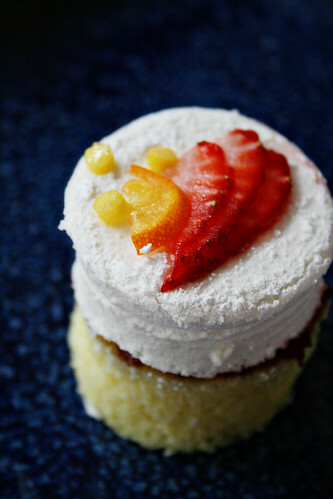 These elegant little stacks of marshmallow, fruit, preserves, and cake can be fat-free if you use angel food cake. Making marshmallows is certainly a project, but it can be a blast with kids home on holiday break. Cut up the leftovers to enjoy in hot chocolate, stirred with a candy cane. The instructions are lengthy, but don't be intimidated: Making marshmallows is easier than it might appear, provided you have a stand mixer and a candy thermometer. And the marshmallows alone make great holiday gifts for friends and neighbors. This marshmallow recipe is adapted from Smitten Kitchen. The marshmallows need to be made at least a few hours ahead; leftover marshmallows can be stored in an airtight container for a few days. Lightly oil the bottom and sides of a 9x13 pan and dust with 1/4 cup confectioners sugar, shaking out excess. In the bowl for your mixer, pour in 1/2 cup of cold water and sprinkle gelatin on top. Let it sit so the gelatin softens and blooms, about 15 minutes. In a small saucepan, combine remaining 1/2 cup of water, sugar, corn syrup, and salt. Clip a candy thermometer to the side. Stir over low heat until the sugar is dissolved. Increase the heat to medium heat and bring to a boil, without stirring, until it reaches 240°F (this can take 10-15 minutes). Take the pan off the heat. Carefully pour the sugar mixture over the gelatin in the mixer bowl and stir to dissolve the gelatin. Using the mixer, beat on high speed until the mixture is white, thick, and about tripled in volume (about 6-8 minutes). In a separate bowl, with clean beaters, beat egg whites until they hold stiff peals. Beat whites and vanilla extract into the sugar mixture until combined. Pour the mixture into the prepared pan. Combine remaining 1/4 cup confectioners sugar and cornstarch and sift over the top. Set it in the refrigerator, uncovered, for at least three hours and up to one day. Once the marshmallow has set, you can remove it from the pan by loosening the edges with a thin knife and peeling the marshmallow block out, or inverting the pan. Level the cake. Use a cookie cutter (round, square, or diamond work well) to cut out cake pieces. Clean and dry the cookie cutter, dip it into confectioners sugar, and use it to cut out identical marshmallow pieces. 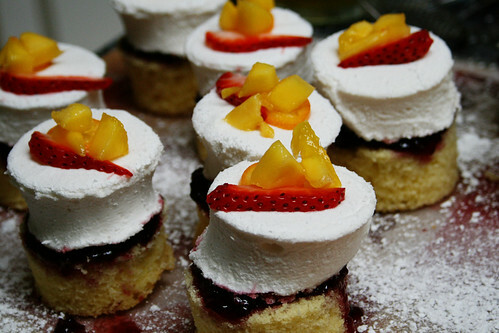 Spread fruit preserves on top of each piece of cake. Place marshmallow cutouts on top of preserves, then top with fruit. This is one of my favorite desserts ever: It was created by Darienne as a happy accident that came together on a day when nothing else was going smoothly. So, after realizing that she would have people over but had nothing ready to serve, she improvised some impromptu snack that turned out to be a huge success: She sliced up persimmons and apples, pulled apart a pomegranate, and chopped up some dates. The dressing came together quickly, and the final touch was cinnamon and some fresh basil. I keep using this recipe for lots of different fruit salads: Pomegranate is a huge success as it adds flavor and crunchiness. I already prepared that with organic chopped Fuji apples, dried figs, strawberries and added fresh grapefruit for a nice finish on the dressing. Pears are a nice substitute for the apples. For tips on using fresh pomegranate, check out this post. Combine the lemon juice and two cups of water in a small bowl. Add the apple slices and let sit for 10 minutes (this helps prevent browning), then rinse and drain well. 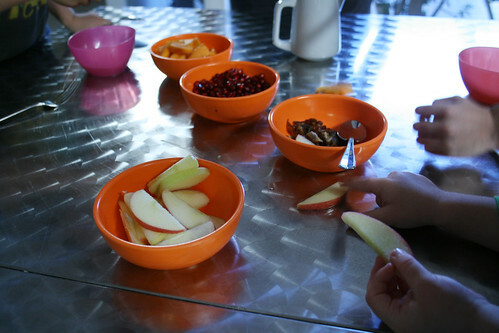 Set out apple slices, persimmon slices, pomegranate, and dates in separate bowls. In a small bowl, combine dressing ingredients and whisk until blended. Pour dressing into a cream pitcher or measuring cup to make it easy to pour. Children can spoon fruit into their bowls and pour dressing over it. If you're making this without the help of little hands, just combine all the fruit in a large bowl, add dressing to taste, and stir to combine. Here we are with our suggested third course for a light and elegant holiday dinner. If, like me, you are looking for a very easy going dish - and even impressive- to entertain your friends and family, this might be it. Since we published this recipe we had some good feedback, and, of course, you can easily adapt this to seasonal ingredients or different fish. 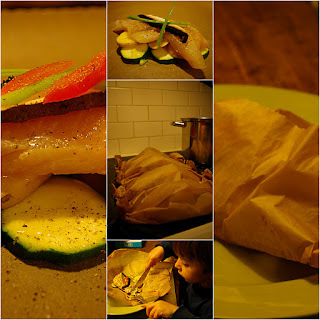 Last time I prepared something inspired in this recipe, I used fig leaves and halibut, something really like a recipe from one of my favorite Alice Waters's book. 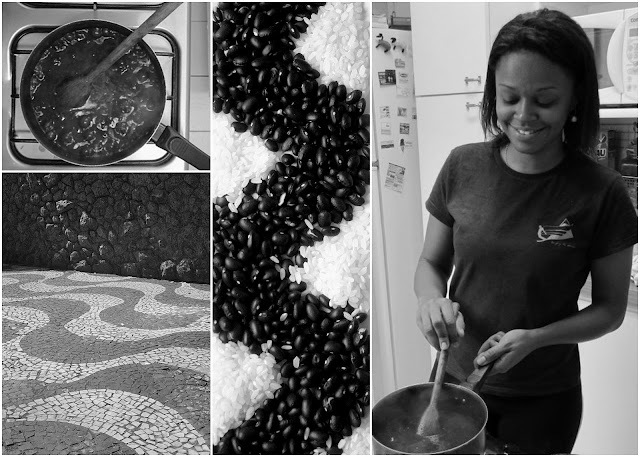 And don't miss it: tomorrow we will have a brand new recipe from our oven to make a surprising fourth course! Any white meat fish will do well for this recipe, as far as it is one chosen from the list available online from Seafood Watch. I always carry my pocket guide everywhere so not to be doubtful of what to do when shopping. 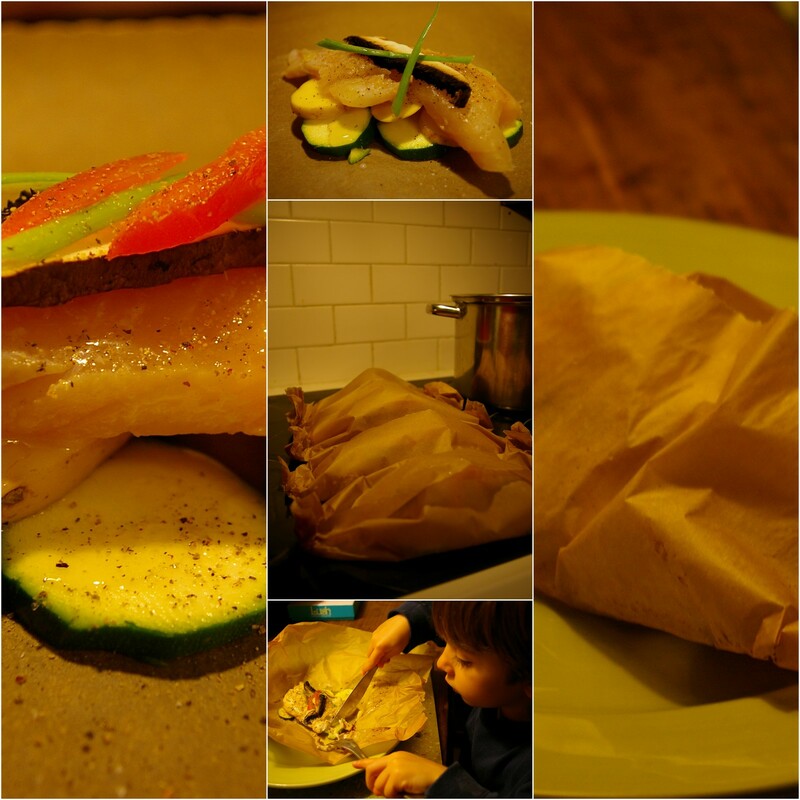 Preheat oven to 400 F. Cut parchment paper in 4 equal parts, enough to wrap the fish towers. Layer 6 circles of zucchini on the bottom, topped with 4 slices of potatoes, and then fish. Finish with slice of portabella, tomato half-moon, and spring onion. Season each layer with a bit of salt and pepper and drizzle olive oil. Fold and close parcels loosely. Bake for 15- 20 minutes, depending on how you like your fish done. If you're looking for the perfect side dish for your holiday table, this is it. 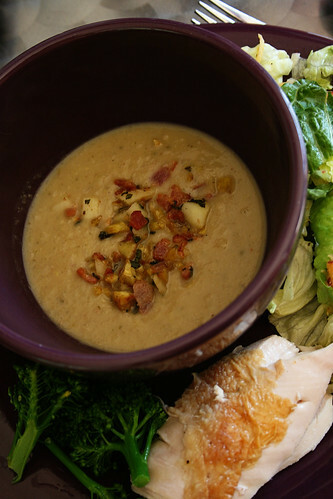 I love the delicacy of this soup, the mix of savory and sweet, the smoky bacon. I don't love the prep work, however: It will be a lot easier to make if you use vacuum-packed, ready-to-go chestnuts. Peeling hot chestnuts is tough work, and certainly not the kind of work I want to be stuck doing amid holiday celebrating. If you go the fresh route, consider peeling the chestnuts ahead of time and stashing them in the freezer. If you don’t buy peeled chestnuts, I recommend peeling them in advance and freezing them until needed. The diced bacon also can be cooked ahead of time, to save on-the-spot prep. If using fresh chestnuts, bring a saucepan of water to a boil. Carefully cut the chestnuts in half with a sharp knife and put them in the freezer for 10 minutes. Add the chestnuts to the boiling water; boil for 8 minutes, then drain. Squeeze each half to pop out the meat, along with the dark brown pellicle surrounding it. This is much easier to do while the chestnuts are hot; you might want to do this in batches. If using dried chestnuts, bring a large pot of water to a boil. Add the chestnuts and simmer 10 minutes, then remove from heat and let soak for an hour. Vacuum-packed chestnuts can be used straight from the jar. To make the soup: Cook the onion, celery and 1/4 cup coarsely chopped sage leaves in a large saucepan over medium heat, stirring frequently, until onion and celery are soft, about 5 minutes. Stir in all but 1/2 cup of the chestnuts along with the broth, cider, thyme, and bay leaves. Cover and simmer over very low heat for 45 minutes. Remove and discard the thyme and bay leaves; stir in vanilla. Purée the soup in batches (an immersion blender is great for this) until very smooth. Stir in cream and sherry, and reheat to simmering. Add salt and pepper as needed. Cook the bacon in a medium skillet — don’t let it get crisp. Drain excess fat, then add in the reserved chestnuts and cook another minute. Stir in apple and cook until warmed through. Spoon soup into bowls, topping each with the apple-chestnut garnish. We want to celebrate the holidays with a 6-course menu with recipes from our repertoire with a holiday twist. From today up to next week we will post our favorite choices and some new ones to welcome a very healthy New Year! For our first course we chose this simple yet amazing Strawberry Spinach Salad. The colors are very holiday-ish, you can even decorate it as a Christmas tree. And if you are not close to any fresh strawberry as we are, here in California, you can substitute for fresh kiwis, figs or ripe yellow peaches. You can choose different ingredients for the main salad. I've combined it with rocket and once used basil instead of spring onions. Kids might want to join you on the presentation, which can be really cool. Mix all ingredients for the dressing at least one hour before serving. Organize each plate with a bed of spinach and slices of strawberry. Serve with the dressing on the side or pour over the salad, leaving the guest to redesign the plate. Enjoy! This year's gingerbread people coming from the oven are molasses-free and also vegan. Hmmm, and they are .... yummy! This is a twist to traditional recipes for the holidays so that everybody — even the egg- and dairy-intolerant people, or the ones who don't like molasses taste (like me) — can have a bite to celebrate the season. Agave is a cactus originally from Mexico. Its syrup, or nectar, is deliciously sweet, and became popular lately as a alternative sweetener due to its low glycemic index. Mix oil, sugar, and agave nectar with almond milk. Add ginger. Sift in flour with baking powder, baking soda, salt, and spices. Knead or mix with a paddle attachment of a stand mixer until it forms a smooth dough. Pat it into a disc and cover with plastic wrap, then let it rest in the fridge for at least one hour. Bake for about 15 minutes. Let them cool down before decorating.